A poet is unquestionably a dreamer, and poetry is essentially human and elemental. Despite the prevailing atmosphere of a chaotic world that seems to no longer know how to enjoy the ethereal beauty of nature, or just couldn’t care less about it, this most noble art still retains its cathartic power over all those who would wish to a stop for a moment and enjoy the music and the poetry of the elements in all their forms. And those who appreciate the fascinating cycle of the seasons and the part they play in the overall pattern of everyday life as day by day it eludes us. Many have been the elements which, throughout the ages, have inspired the greatest poets to pen immortal lines that have survived to this day. Nature, with its splendours and its follies – particularly, the sea, equally fascinating whether calm and serene in summer or breaking waves sky-high and dashing them against the rocks in some furious winter storm. One of the poets who has always been fascinated by the sea, I dare say identified himself with it, literally and/or metaphorically, has been the prolific Gozitan poet Charles Bezzina. Since his very first collection of verse quite some time ago, Bezzina has always been intensely linked with the poetry that not only glorifies the sea in all its aspects and its moods, both positive and negative, but also as a focal point to complement the relative season it is contemplated upon and the attendant backdrops. Add to this the insistence of Bezzina to stick to the classical form of poetry, with its perfect rhymes and rhythms, and messages clearly relayed without the enigmatic and very often puzzling question marks that modern poetry invariably poses to the reader. 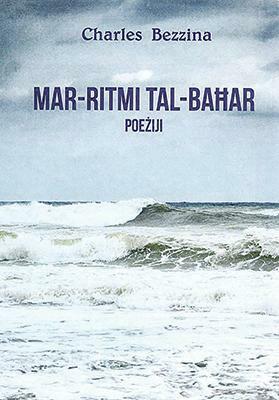 Once again, Bezzina has regaled us with yet another thick tome of poems: Mar-Ritmi tal-Baħar – 168 poems, all in the classical style, all glowing with the ephemeral beauty of romantic poetry at its best. These poems are all elemental in nature, in subtle forms or otherwise, and all musical to a degree, which makes them a joy to read aloud. In an excellent preface to the book, Charles Briffa analyses in depth both the poet and his works. He delves deeply into his psyche, seeking to discover, and/or expound about, the sheer sensitivity of Bezzina the man and the poet, the effect that his love for both sea and landscapes has on his poetry, his life and his soul. Indeed, this is a veritable intimate psychological study on one of the best and most romantic poets Malta has ever had. A beautiful quote by William Wordsworth in praise of the poet serves as a prelude to the collection, and the rest is a delectable ramble into a world of beauty that only poetry at its best can offer. Particularly beautiful are: Bint il-Baħar, Xi Darba Nurik Mewġa, Skiet, Nixtieq li Meta Norqod, Erġa’ Għidli Mulejja, Konna Ltqajna, Il-Ballata tal-Wied and Tħallix id-Dalma. These, and practically all the poems in this book, invariably relate not only to the poet himself as a persona but also to nature, with which Bezzina has always been fascinated. A good number of the poems, of course, relate to the idiom of the sea. But very often, and to his credit and the knowledge of his art, Bezzina uses such poems as a departing point, to reach out (sometimes metaphorically) into further themes and topics, which more or less preoccupy the average poet, such as sorrow, pain, joy, disillusionments and disappointments. They also delve into a growing, sad preoccupation in the face of an insensitive, indifferent, violent and chaotic world that is essentially materialistic and totally adverse to things romantic. Yet, hope, that springs eternal in every true poet’s heart, is once again prevalent, and a dominant factor. It is a genuine and desperate cri de coeur, this beautiful tome. It is even more intense than in Bezzina’s former collections. It seems that the passing of the years is making the poet more than ever aware of the way the world is going. In his sensitive approach to reality, crude as it may be, he seems set on showing that a dreamy, poetic, romantic approach to life may be, after all, a good solution, if not a permanently curative one, for all the physical and spiritual ailments that beset and scourge today’s utterly cynical and insensitive world. A number of critical comments on Bezzina’s poetry round up this collection. Mar-Ritmi tal-Baħar is beautifully and neatly printed, with an enchanting glossy front cover that is a visual poem in itself. This is indeed a collection of poems that are there to be relished and enjoyed, the prime object of what poetry stands for, after all, in its pure, unsullied and ethereal nature. And reading Bezzina’s lines is (as it has always been) an experience of pure enjoyment, an invariably delightful romp through a mystical aura that only spiritual joy and pure poetry can guarantee.